When you think about it buying a radiation monitor is a rather odd thing to do. For most of us radioactivity or ionising radiation is something we rarely think about, except when it hits the headlines, following a serious incident, leak or explosion, and that’s when the trouble begins. The media revels in a good scare story: all of the old clichés are rolled out, a lot of people are unnecessarily worried and think they need a Geiger Counter for their personal safety or to prevent them from growing two heads (the chances of developing super powers after radiation exposure have yet to be proved scientifically...). The fact is, the only people who actually need radiation monitoring equipment for health and safety reasons are those involved in the handling of radioactive materials, or can reasonably expect to encounter potenially hazardous radioactive sources in the course of their work. The devices they use are usually highly specialised and supported by trained experts and technicians who know how to interpret the readings they provide. At the risk of losing sales we have to say that this is not what we are about here at anythingradioactive..
We sell radiation detection and monitoring equipment for everyday use and - dare we say it - for fun, leisure and education; they are the sort of thing that's of interest to geologists and rock hounds, 'dark' tourists, antique collectors, students, 'doomdsday' preppers and of course to satisfy the curiosity of science nuts and gadget freaks, like us. The point is none of the instruments that we are involved with are intended for safety-critical or health and safety related applications, So please don't waste your money if you think a Geiger Counter is going to protect you against radioactive fallout, poisoning or atomic mutation. Of course, that's not to say if you have one and encounter a an unexpectedly lively source of radiation it is prudent to move smartly away from it and report it to the appropriate authorities, such as the police, the UK Health protection Agency, or your local health, safety or environmental agency. By the way, it's important to distinguish between ionising and non-ionising radiation. The latter are electromagnetic fields coming from from the likes of mobile phones and radio transmitters and none of our instruments are designed to respond to it. The jury is still out on the health effects of electromagnetic (EM) radiation and we're not about to get into that debate. You should also be wary of electromagnetic detectors being wrongly described as Geiger Counters. 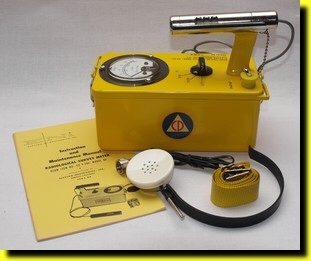 Let’s take a look at the different types of radiation monitor that we sell, starting with the classic Geiger Counter that everyone has heard of and seen in the movies . A lot of devices are mistakenly or misleadingly referred to as Geiger Counters so let’s sort that one out straight away. To qualify as a pukka Geiger Counter an instrument should employ a device called a Geiger Müller tube, which detects radioactive particles or waves and, by some means or other, is able to count or log the ‘clicks’ generated by the tube when it detects radioactivity. The counter part is important as this allows measurements to be directly observed or recorded so they can be compared with readings taken over time or in other locations. The displays on Geiger Counters vary enormously. For example, our CDV-700 (top of the page) and GeigerActiv Pro models show relative levels of radioactivity in clicks or counts per minute (cp/m) on a simple analogue meter. This is really easy to understand; the higher the reading the greater the level of radioactivity. In contrast our Soeks Defender (left) and Gamma Master (above) models all have digital readouts, normally calibrated in microsieverts per hour (uSv/h). It’s a more sophisticated way of measuring radioactivity, compared with counting clicks, and it can provide a more accurate representation of the received level of activity or dosage and its potential health effects, but the general idea is the same, the higher the reading the more radioactivity there iis. All of these instruments are sensitive enough to register natural background levels of radioactivity. This makes it is easy to establish a benchmark reading, so a higher or elevated reading will be immediately obvious. 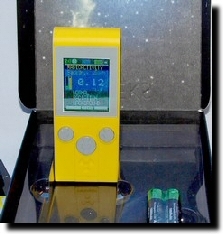 The next class of instrument is the dosimeter, and the models that we sell or have sold, like GeigerActive Personal Plus, K8 Nuke (right) GeigerActiv K, DSRB-01 and DSRB-88 also employ Geiger Muller tubes for detection. However, these do not count or have displays as such and respond to radioactivity by clicking, bleeping and/or flashing an LED. 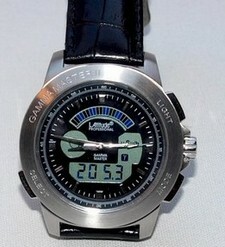 By observing the clicks and flashes it is possible to gauge the relative level of activity. This makes it useful for identifying localised sources of radioactivity, prospecting and so on. 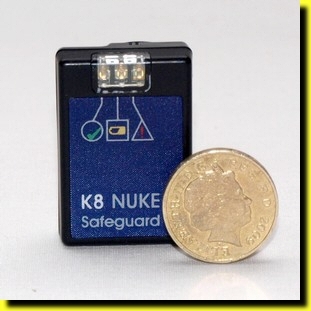 Some models, like the K8 and DSRB-01 have a built in ‘alarm’ facility that sounds an alert or illuminates an LED when the level exceeds a preset threshold, so it can act as a very basic warning device. Additionally, our GeigerActiv Pro has a facility to connect to a PC, and with the software supplied it is possible to display and keep a record of the readings, effectively turning it into a simple Geiger Counter. The dosimeter family also includes things like film badges and ‘Pen’ type dosimeters. These are passive devices that record radioactive dosage over time. They cannot be used for detecting or as warning devices as the measurements they take are analysed at preset intervals, hours or days after exposure. The last category of instrument is the CDV-715 Survey Meter; unfortunately now out of stock. Like the CDV-700 they were produced in the US in the 1960s and 70s, at the height of the Cold War. Copyright © 2006 - 2016 anythingradioactive.com.